During recent years, groundwater exploitation and thereby decreasing hydraulic head in the compressible sedimentary aquifer which is placed in the district 19 of Tehran have been caused noticeable land subsidence. The land subsidence has been damaging the infrastructures which have been being built in the south of Tehran Basin, especially in the district 19 of Tehran. A finite-difference groundwater flow model (MODFLOW) and a synthetic aperture radar (SAR) method have been used to estimate and predict the rate of land subsidence in this area, and help hydrogeologists manage the vital groundwater resource correctly. The data have been imported into the model, and the change of the amount of land subsidence and head have been obtained for 39 years. Then the available radar images have been processed. Afterwards, the head calibration and subsidence calibration have been done. The results of the calibrations confirmed the accuracy of the results obtained by the model. Finally, this study suggests that 118 mm of land subsidence and an 11.6 m piezometric head decline are likely to occur from 2014 until 2043. Calderhead, A., Therrien, R., Rivera, A., Martel, R. and Garfias, J., 2011- Simulating pumping-induced regional land subsidence with the use of InSAR and field data in the Toluca Valley, Mexico," Advances in Water Resources, vol. 34, pp. 83-97. Carbognin, L., Teatini, P. and Tosi, L., 2004- Eustacy and land subsidence in the Venice Lagoon at the beginning of the new millennium, Journal of Marine Systems, vol. 51, pp. 345-353. Chang, C., Chang, T., Wang, C., Kuo, C. and Chen, K., 2004- Land-surface deformation corresponding to seasonal ground-water fluctuation, determining by SAR interferometry in the SW Taiwan, Mathematics and Computers in Simulation, vol. 67, pp. 351-359. Darvishzadeh, A., 2006- geology of Iran, Amirkabir press: Amirkabir University, pp. 1-286. Erban, L. E., Gorelick, S. M. and Zebker, H. A., 2014- groundwater extraction, land subsidence and sea-level rise in the Mekong Delta, Vietnam, pp. 1-5. Ferretti, A., Monti-Guarnieri, A., Prati, C., Rocca, F. and Massonet, D., 2007- InSAR principles-guidelines for SAR interferometry processing and interpretation vol. 19. Hayashi, T., Tokunaga, T., Aichi, M., Shimada, J. and Taniguchi, M., 2009- Effects of human activities and urbanization on groundwater environments: an example from the aquifer system of Tokyo and the surrounding area, Science of the total environment, vol. 407, pp. 3165-3172. Leake, S. A. and Galloway, D. L., 2010- Use of the SUB-WT Package for MODFLOW to simulate aquifer-system compaction in Antelope Valley, California, USA, in Land Subsidence, Associated Hazards and the Role of Natural Resources Development: Proceedings of the Eighth International Symposium on Land Subsidence: Queretaro, Mexico, International Association of Hydraulic Sciences, pp. 61-67. 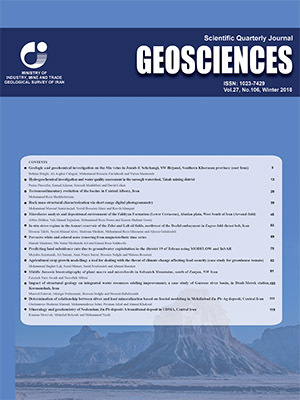 Mahmoodpour, M., Khamehchiyan, M., Nikudel, M. R. and Ghassemi, M. R., 2015- Numerical simulation and prediction of regional land subsidence caused by groundwater exploitation in the southwest plain of Tehran, Iran, Journal of Engineering Geology, vol. 201, 6-28. Molaei, M., Meshkat, T., Akbari, K., Nazarjani, M., Esmailzadeh Nasiri, M. and Hesami, A., 2016 - Report of water resources’ management of Tehran, Iran Water Resources Management Company, chapters 1-6. Phien-Wej, N., Giao, P. and Nutalaya, P., 2006- Land subsidence in Bangkok, Thailand, Engineering geology, vol. 82, pp. 187-201. Roustaei, M., 2016- considering the subsidence of Tehran Provience, presented at the Conference of land subsidence phenomena (GSI), Iran. Sun, H., Grandstaff, D. and Shagam, R., 1999- Land subsidence due to groundwater withdrawal: potential damage of subsidence and sea level rise in southern New Jersey, USA, Environmental Geology, vol. 37, pp. 290-296. Tosi, L., Teatini, P. Carbognin, L. and Brancolini, G., 2009- Using high resolution data to reveal depth-dependent mechanisms that drive land subsidence: the Venice coast, Italy, Tectonophysics, vol. 474, pp. 271-284.